Mother Nature has really thrown up a yellow card on Chestermere United FC this season. With winter stretching far too long into spring, the first couple of weeks of soccer games will be cancelled due to unplayable pitches, but that doesn’t seem to be the worst effect right now. Because summers are so short in this province, the United FC is finding that registration is down across the board simply because there aren’t enough nice days to enjoy a regular outdoor life. “The teams we have are good, but our overall numbers are down,” said Chestermere United FC executive director Dave Clarke. “We’ve seen quite a drop this year. “It isn’t that we lost them to other clubs. It’s that simply and purely people are so fed up with winter that they want the summer off. That’s the message we’re getting back. Clarke cites soccer fatigue as a bit of a problem. There is only about a month break between the indoor season and the outdoor one, which makes for a tough transition in the spring, especially when we’ve experienced bad weather and torrential amounts of snow. “The kids don’t get a break, which is silly,” Clarke said. “Outdoor to indoor is a little better. We finish in August and don’t start up again till late October. That gives the kids a break. With going outdoors untenable the last few weeks, local players have been pushed inside, mainly to school gyms. 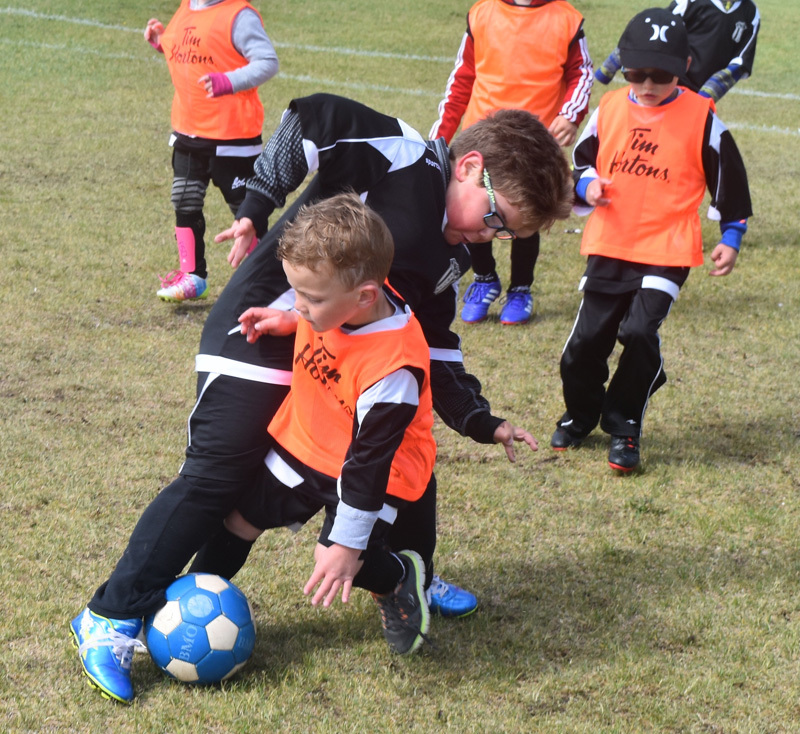 During the indoor season, Chestermere teams are playing the soccer dome in southeast Calgary, Okotoks, Airdrie or Bearspaw. Clarke says he’s pushed for an indoor facility for the past seven years but hasn’t received much traction in that respect. His argument — if you built it, they will come, and it will make money — hasn’t been adopted yet, but he’s still pushing for it. The theory is an indoor facility will not only benefit soccer players, but those from many other sports could use it as well and it could also be a cash cow for the community. He does credit the city for creating a couple new outdoor fields at East Lake School and Our Lady of Wisdom School, but he feels there is a missed opportunity on an indoor facility. United FC have teams in all levels this season, except for men over 18. Clarke says most of the players for those teams are off doing other things such as coaching or raising families and it’s too tough to fill out rosters. There is a positive this season though in that there are now three women’s teams for those over 18 — two of which are for those over 35. Clarke said the Chestermere teams compete at the highest level they can, but they will encourage players of higher skill levels to head elsewhere if they are above what the United FC can offer. That has happened a few times over the years, but it’s always a positive for the program. They are working on skills development for their players though, and have added a new partnership they hope will help with that. The United FC has teamed with the Vancouver WhiteCaps to hold an eight-week camp starting in May that Clarke hopes will be a big benefit for those who participate. The club is also holding their three-day camp with England’s Stoke City FC for a fourth year, which will take place in July. There are plenty of good things happening with the soccer club. They just need to get going on the outdoor season.